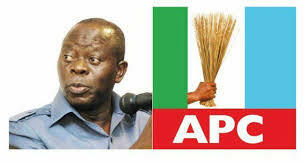 The National Chairman of the All Progressives Congress, Mr. Adams Oshiomhole, has lauded the party’s supporters in Rivers State for their “fighting spirit” amid their political travails. Oshiomhole, who spoke at the APC presidential campaign rally in Port Harcourt on Tuesday, stated that President Muhammadu Buhari was hurt that there were a lot of efforts to allegedly award elective positions to the Peoples Democratic Party. He said, “The President was hurt that there is so much effort to award positions without attestations to the PDP. “In Zamfara State, we are fighting to have the rights of our people to choose who they want; and here in Rivers State, that right seems to have been taken away. “But our rights could be frozen; it cannot be detained forever. “There is a saying that you don’t laugh at the crocodile until you are very certain that you have crossed the very last river. According to the APC chairman, the APC is committed to justice, fairness and democracy. He said, “These are tempting moments when men of little hearts would give up as if this is the end of the world. “Those who may be smiling that they will become what they do not deserve will find that, as they say, the downfall of a man is not the end of his life.